Let me share a memory with you. It’s a childhood memory, about an event from when I was around 13 or 14 years old. My father and I are playing soccer together. He is the goalkeeper, standing between the posts, I am the striker, taking shots from outside the box. My dad has been encouraging me to shoot with my weaker left foot, to develop the skills that come more easily on my more natural right side. He throws the ball to me, I control it on my chest, let it drop, and hit a sweetly-timed volley with the outside of my left foot. The ball arcs perfectly towards the goal. My dad moves across to save, although I’m not sure he has it covered, and then the ball thunders off the crossbar. Even though I didn’t score, I have an intense feeling of satisfaction, of executing a near perfect left foot volley, the quality of which I have struggled to reproduce in the intervening years. This memory has a rich phenomenology: it involves visual and motor imagery as well as emotion. Yet there’s an important feature of this memory, which is perhaps not apparent in the way I describe it. As this dynamic and evocative memory unfolds, I see not only my father, the ball, and the goal, but myself too. I see myself in the remembered scene, from the outside, as if someone had filmed us playing together and I am watching the old footage. Such memories are called “observer memories.” Do you have memories such as these? Take a moment to think of the last time you gave a talk in public, or the last time you went swimming. Or, if public speaking and swimming aren’t your thing, think about an early childhood memory, an early birthday perhaps. Such events are often recalled from this type of third-person perspective. When you recall these events do you picture yourself in the remembered scene? Do you see yourself from-the-outside? Indeed, can you switch perspectives, flipping between a first and third-person perspective? Some people can. Here’s another question. How does this feature of my memory, of your memories too perhaps, strike you? Does it seem natural, or odd? Is there no doubt in your mind that it is a genuine memory? Or, conversely, are you sure that such images, with their anomalous points of view, simply cannot be genuine memories? Such a worry is quite intuitive, I think. How can an image in which you see yourself from-the-outside, from a point of view you didn’t occupy at the time of the original event, be a genuine memory? If memory preserves the content of perception, then these images shouldn’t count as memories. Yet science tells us that memory does not simply preserve the past. Memory is constructive. It is fluid and flexible, alive to the context of the present moment in which we are remembering. Images from an observer perspective may be the products of such a constructive system, which imaginatively modifies and moulds our memories by drawing on information we didn’t hold at the time of the original event. …the context of the perceptual experience can encourage us to adopt an external perspective on ourselves at the time of the original event. We can, in a sense, get outside of ourselves. I think this is the right story to tell about such observer perspective memories, at least in part. But I don’t think it is complete. Memory is constructive not only at the time of retrieval, but right from the start, during the processes of encoding. Perceptual experience involves more than sensory stimulation, and even at the time of the original event we are attending to, selecting, interpreting, and integrating information from various sources into a memory of the event. Memory is alive to the various sources of information and the context in which the event took place. I suggest that, at least sometimes, the context of the perceptual experience can encourage us to adopt an external perspective on ourselves at the time of the original event. We can, in a sense, get outside of ourselves. 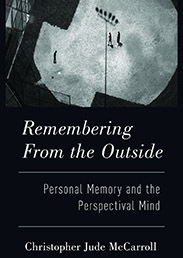 This is not to suggest that such observer perspectives are memories of out-of-body experiences. You don’t have to literally see yourself during the perceptual experience in order to see yourself in a memory of that experience. When you are remembering an event from an observer perspective you are not remembering seeing yourself at the time of the event, you are simply remembering the event in different way. A different point of view can convey different information and promote understanding. Indeed, perspectives which go beyond the purely egocentric are not only found in memory, but in imagination, dreams, spatial cognition, art, language, and gesture, and they help us think about and interpret events and environments. So, again, take a moment to think of your memories. Perhaps after reading this you will be aware of a curious feature of some of your memories, or of those of someone you know. Perhaps you’ll be aware that you, or others, sometimes remember from-the-outside. Featured image credit: Photo Lens Lenses by jarmoluk via Pixabay. Christopher McCarroll, Postdoctoral Researcher, Centre for Philosophical Psychology, University of Antwerp, Antwerp, Belgium. I read an article about visualizing yourself doing something in a sporting event. The idea was to sharpen your focus on perfecting a technique. Your article may correlate to that same subject. Visualization is a useful method for achievements in competitive sports. And perhaps any physical activity.